This page is dedicated to presentations and results of the Thought Leaders Forum on Environmental and Energy Education and Sustainability. More results still to come - stay tuned! 1) Why is energy and environmental education important? To fulfill our obligation to future generations and to create a sustainable future. To develop lifelong skills, including: leadership, innovation, problem-solving, and creativity. To teach students how to be engaged local and global citizens. 3) How do we get to success? Think big and start small- just start somewhere. Next Steps: What Can ACEE and Partners Do? We asked participants to prioritize, using a 'dot' exercise, key actions to help education leaders advance student learning around the environment and energy and/or to help green the school infrastructure. Here's a summary of the results! Speak to junior high and high school students regarding interest and their ideas moving forward. Testimonial of the students from Fort McMurray. Make students and staff aware of how we can all help to improve things we do that can help the environment. People for Energy and Environmental Education (PEEL) to be more known as a resource for teachers so energy and environmental literacy is more accessible. Go to leaders’ group to promote more project-based [learning] in environmentalism. Incorporate awareness of environmental stewardship into existing programs and projects. Create student blogs to advertise some of the great things they are doing. Brand new school in our division. I will ask: How cutting edge is it as an energy efficient building? Go back and share the information with other staff and students. Hopefully inspire others. Invite our high schools to connect with Fort McMurray students to talk about joint work. Take to committee of the whole for discussion. Traffic calming - student group - how to get kids to walk to school. Introduce all of my active school travel schools to People for Energy and Environmental Literacy (PEEL) to increase environmental stewardship. Communicating with educators what facilities (personnel) are doing to support environmental and energy education. Once understood, have educators communicate that information to students. Bring ACEE to jurisdiction PD for teachers. Board conversation about path forward in the environmental energy area. If certification programs are developed, schools will be incented to ‘go for the gold’. 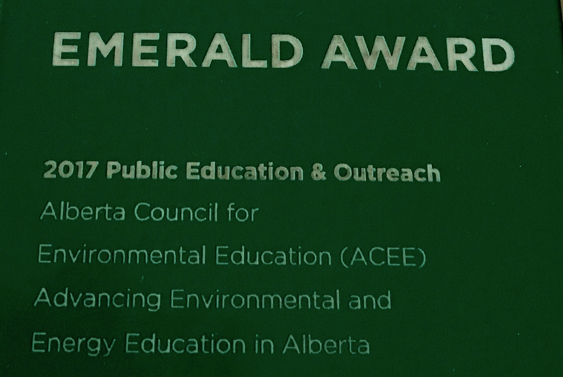 Dedicate staff to grant writing for environmental education. Create buildings that teach a priority - how do we change provincial infrastructure funding & regulations to allow us to build/modernize to support environmental and energy education as part of 21st century learning? Develop a framework for a board policy on environmental stewardship, but acknowledge what is already being done and encourage calculated risk taking. Review Admin Procedure and consider writing board policy regarding environmental and energy education. Continue conversation with mayor and council about recycle bins for schools. Incorporate basics of developing a natural love and connection with the environment through the curriculum. Become more familiar with what schools are presently doing and build from there. Develop a board policy on environmental stewardship. Work on developing a better system to share success stories that will help connect/encourage teachers. Assessing teacher needs to provide support would be a wonderful use of ACEE.